A Pattern in the Absentee Ballots? All eyes in political MoCo are on the County Executive race, which will be decided by absentee and provisional ballots. After the first absentee canvass, Marc Elrich’s lead over David Blair has declined from 492 votes to 149 votes, guaranteeing an absolute squeaker of a finish. Lots of folks are asking why. A preliminary analysis of absentee voting data suggests one reason: for the most part, candidates endorsed by MCEA, of whom Elrich is one, are performing slightly less well in absentee voting than in early voting and election day voting. 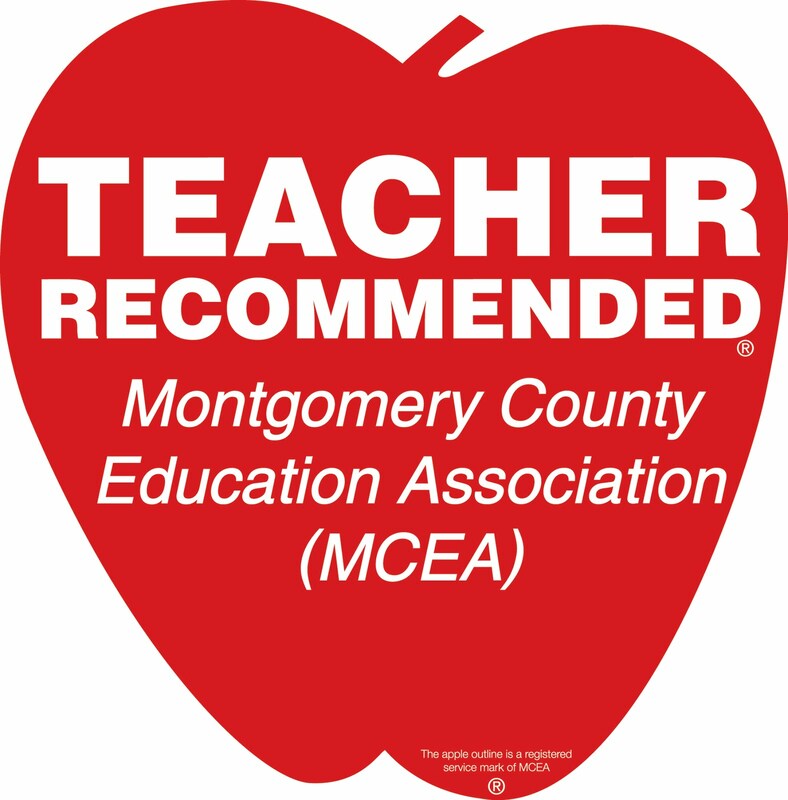 The Montgomery County Education Association (MCEA), which represents MCPS teachers, has historically been the most powerful interest group in MoCo elections. Its political program has combined mail and poll coverage where its mighty Apple Ballot is distributed. This year, its mail program has been partially diverted to the Governor’s race (where the union helped pay for three mailers on behalf of Ben Jealous) and Congress District 6 (where the union sent three mailers for Aruna Miller). Its remaining mailers were one for its State Legislative District 16 endorsees (one of whom was teacher Samir Paul), one for its Council At-Large endorsees (one of whom was teacher Chris Wilhelm) and one with the Apple Ballot itself. The latter mailer was the only one to include Marc Elrich, who was endorsed late. 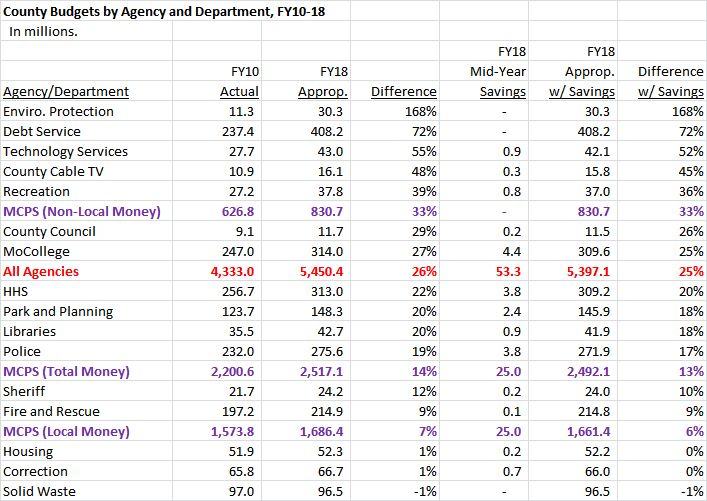 In past years in which races for Governor and Congress were not an issue, MCEA’s mail program was entirely focused on state legislative and county races. Alterations to the mail program may explain variations in absentee ballot voting. 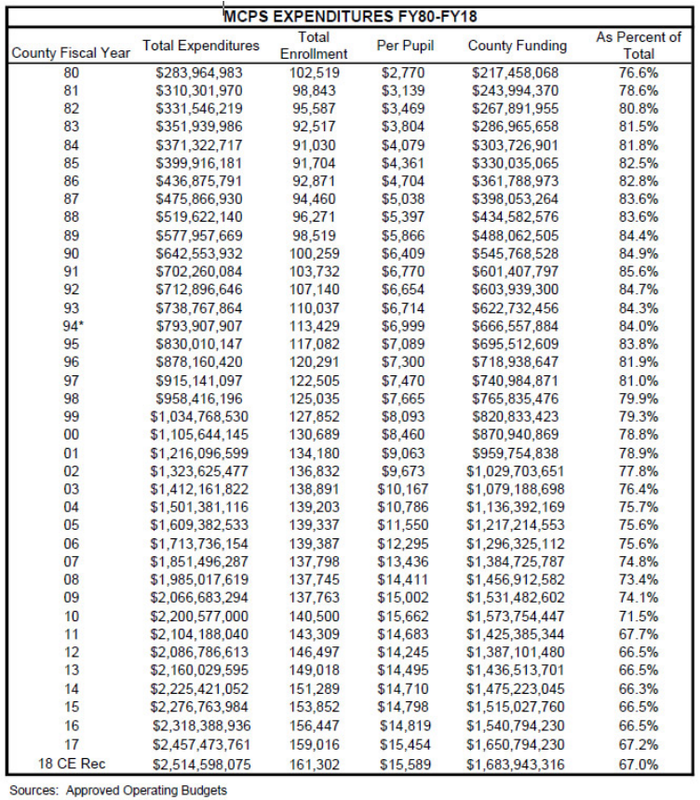 People who vote early, on election day and through provisional ballots may encounter Apple Ballot poll coverage. And it’s not just MCEA who distributes it; candidates who are featured on it often distribute it too. But absentee voters do not go to a polling place. They must be contacted through other means. As stated above, MCEA’s mailers were drawn into races for Congress and Governor and if the union has a robust digital program, we have not seen it. All of this means that absentee voters in General Assembly and county-level races are less likely to be influenced by the Apple. 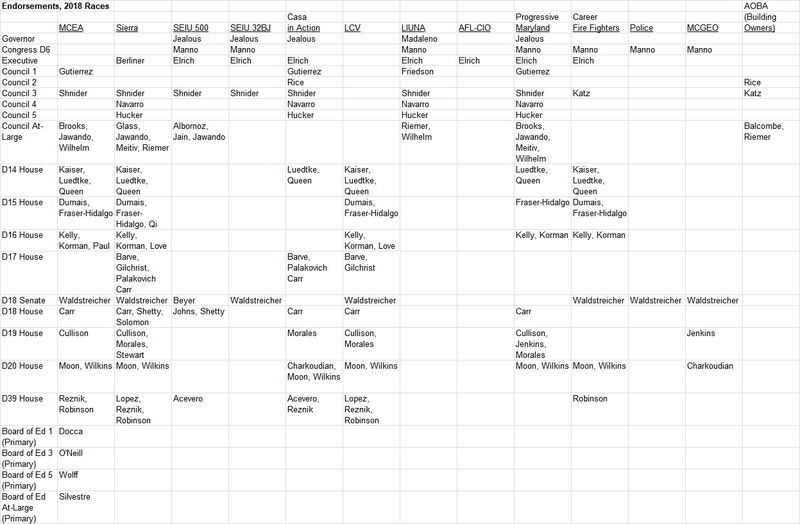 The table below shows sixteen close performances in county races between Apple-endorsed and non-Apple candidates. (We excluded incumbents to remove any incumbent effect on absentee voting.) In each race, the margin between the two in election and early voting results is shown alongside the margin in the first absentee canvass. (Both sets of results are unofficial and there will be another absentee canvass.) 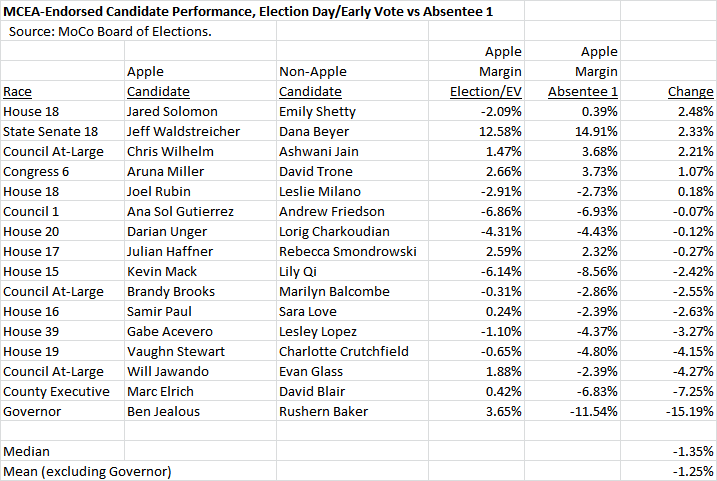 In eleven of these sixteen races, Apple-endorsed candidate performance declined in absentee voting. Now some of these races have other things going on. In Congress District 6, Aruna Miller benefited from MCEA’s three mailers and her performance actually rose a tiny bit among absentees. In the gubernatorial race, a clear outlier, Rushern Baker may have benefited from the Washington Post’s strong endorsement. (This year, the Post did not endorse in Congressional or state legislative races.) David Blair got not one, but two Post endorsements. Elrich’s late endorsement from MCEA handicapped his ability to publicize it, which may have impacted absentee voters. And so on. The Apple Ballot is arguably the best endorsement in the county. Blair would already have won the Executive race if Elrich had not received it. But the data above, however tentative it is, suggests a pattern: the Apple has been slightly less effective in absentee voting. The median performance drop is 1.4 points. The mean performance drop excluding the outlier race for Governor is 1.3 points. So let’s round it in rough terms to a point-and-a-half decline. That’s not enough to affect most races but it is having an impact on the razor-thin contests for County Executive and House 16. MCEA should consider this in designing its future political programs. The Montgomery County Education Association (MCEA) has endorsed Marc Elrich for County Executive. The Washington Post has the story. 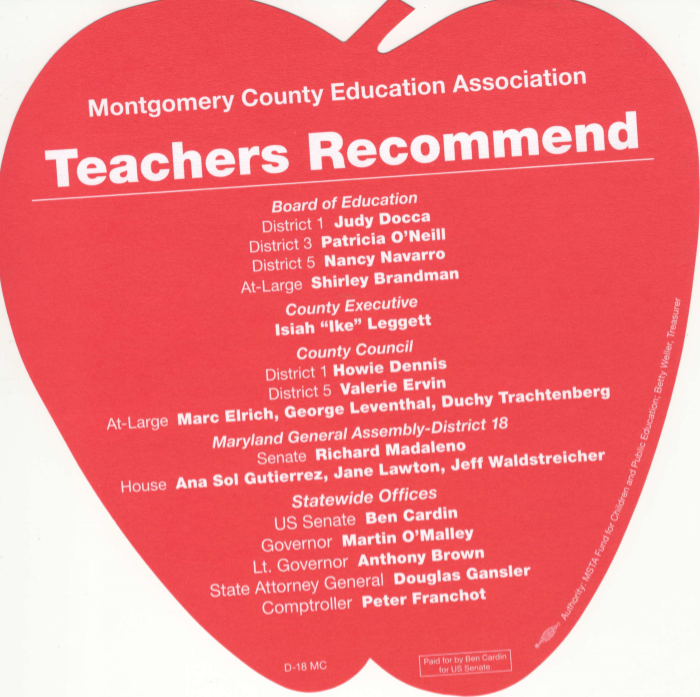 The Montgomery County Education Association (MCEA) has made a new round of endorsements in state legislative races, conferring the influential Apple Ballot on the following House candidates. Combining these endorsements with those previously announced, the teachers are now supporting non-incumbents Mack, Palakovich Carr, Haffner, Solomon, Jenkins, Stewart, Unger, Acevero and District 16 House candidate Samir Paul (who is an MCPS teacher) along with all the state-level incumbents running for reelection except for Delegates Jim Gilchrist (D-17) and Marice Morales (D-19). At the county level, the union has endorsed Ana Sol Gutierrez in Council District 1, Ben Shnider in Council District 3 and Brandy Brooks, Will Jawando and Chris Wilhelm (another MCPS teacher) for Council At-Large while postponing action on most county incumbents. We find it interesting that Gilchrist (who the teachers endorsed in 2010 and 2014) and Morales (who was not endorsed in her first race last time) were the only two incumbents running for reelection who were not supported. Also, the teachers have left one vacant slot in the strongly contested District 18 House race that may or may not be filled and chose not to support Board of Education Member Rebecca Smondrowski, who is running for Delegate in District 17. Depending on what is said about those issues, we may have further comment soon. We have entered the thick of endorsement season and a big one just came out: a partial decision by MCEA, holder of the mighty Apple Ballot. We have updated our institutional endorsement matrix and offer some comments below. First, a note. Many of the listed endorsing organizations have not finished their processes and may be announcing more decisions in the future. Other important organizations (like the Washington Post, the Realtors and the Volunteer Fire Fighters) have not endorsed yet at all. So this list is a work in progress. That said, here are a few impressions. Senator Roger Manno, who might be the most pro-union member of the entire General Assembly, is sweeping labor endorsements in his run for Congress District 6. How far will that take him against Delegate Aruna Miller and Total Wine co-owner David Trone? Council Member Marc Elrich, who is running for Executive, has put together an impressive string of progressive endorsements and he will be getting more of them. He is definitely the favored Executive candidate of the left. Ben Shnider, who is challenging District 3 County Council candidate Sidney Katz, has also become a darling of the left. Will that be enough to take out Katz, who has been the most prominent politician in Gaithersburg for decades? We will have an opinion on that in the near future. Will Jawando, who is running for Council At-Large, has had a great six weeks. He is the only non-incumbent who has assembled four influential institutional endorsements, including the Apple. (Chris Wilhelm has three and Danielle Meitiv and Brandy Brooks have two each.) Combine that with Jawando’s fundraising success, electoral experience and natural charisma and he is looking strong right now. The good news for Delegate Jeff Waldstreicher, who is running for the District 18 Senate seat being vacated by Rich Madaleno, is that he is dominating the institutional endorsements over Dana Beyer and Michelle Carhart. The bad news is that his dispute with House candidate Helga Luest is escalating. Women are 60% of MoCo Democrats and this is a particularly bad cycle to run afoul of them. While MCEA has made some county-level endorsements, it has postponed its decision on the incumbents (except for Sidney Katz). 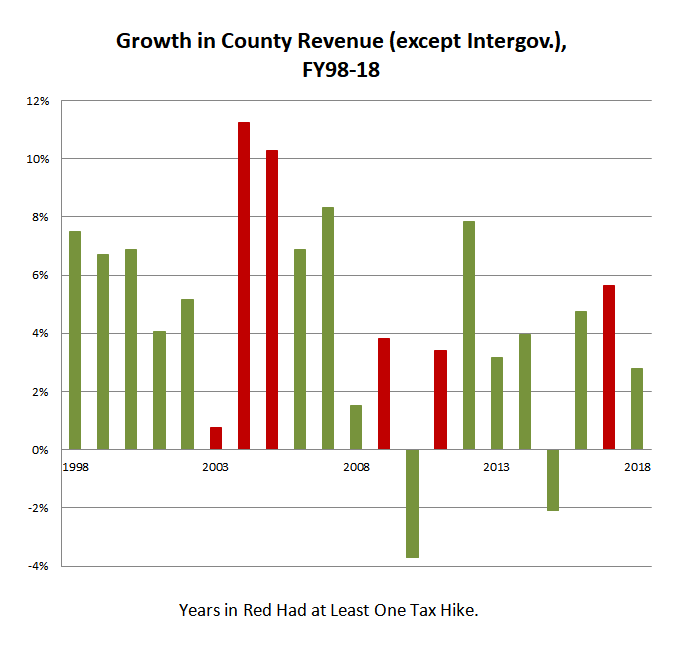 The teachers are unhappy with recent MCPS budget decisions made by the County Council, especially with the breaking of their collective bargaining agreement two years ago. 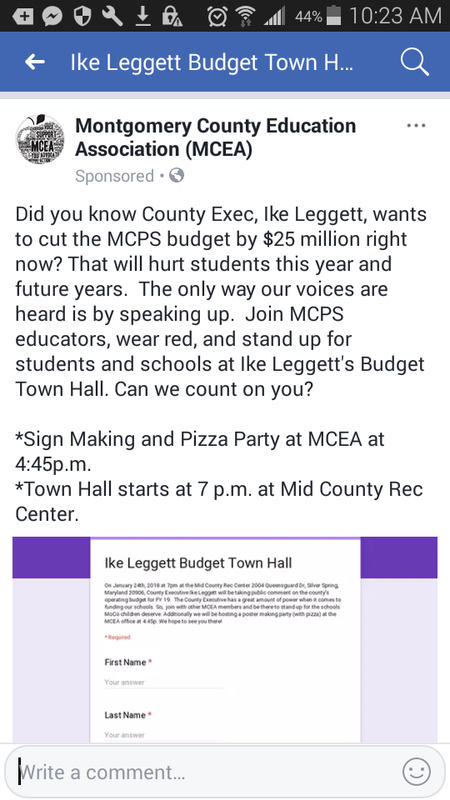 With Ike Leggett’s recommended budget coming next week, we will learn more about what might happen to MCPS this year and that will affect the union’s thinking. The remaining non-incumbents in the Council At-Large race will be paying rapt attention! That’s it for now. We’ll have more when the next wave of endorsements comes in! The Maryland State Education Association (MSEA) has made early endorsements in state legislative races. 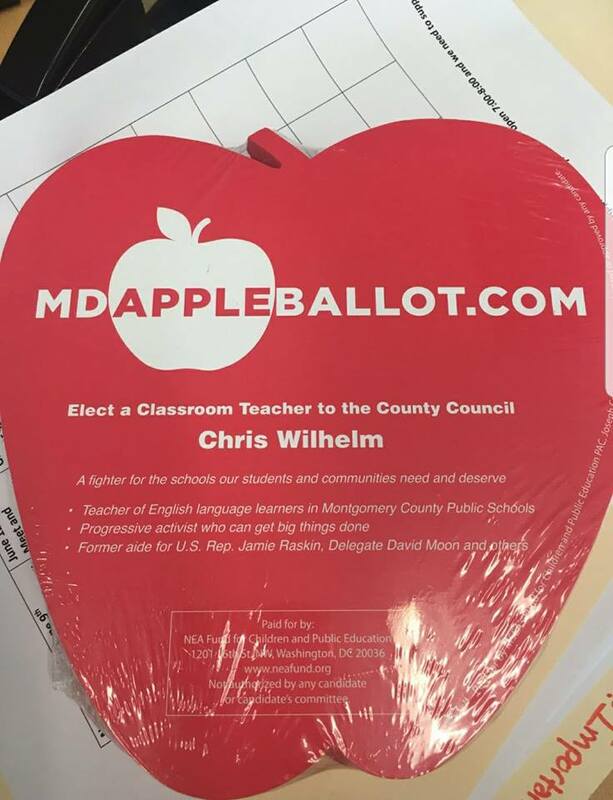 The endorsement of MSEA and its local affiliate, the Montgomery County Education Association (MCEA), deploys the mighty Apple Ballot, one of the most powerful tools in MoCo politics. The endorsements below are just the first batch and more will follow later. 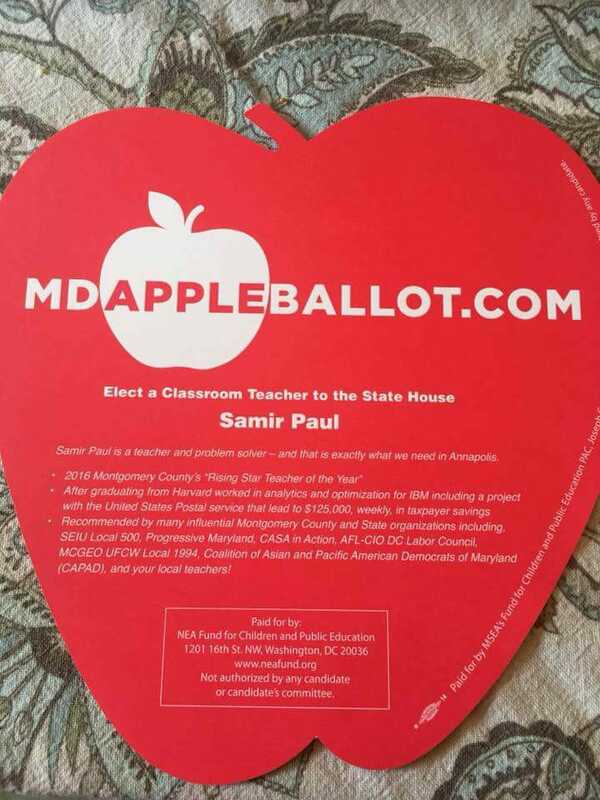 All of the above are incumbents except Samir Paul, who is an MCPS teacher and MCEA member running in District 16. None of them are surprises. The teachers’ endorsement decisions on open seats and contested races will be very interesting. We are sure that every candidate is waiting with bated breath!